A crucial component of understanding how galaxies evolve is figuring out what their earliest years are like. However, this process presents a problem to astronomers, since most early galaxies are believed to have been small and faint and are quite distant to boot. One simple workaround is to study nearby galaxies that we believe have similar properties to the progenitors of older galaxies like the Milky Way or Andromeda. Today’s paper covers the analysis of one such galaxy. Previous observations of the galaxy SL2S0217 using the Hubble Space Telescope have revealed that it is young, small, metal-poor, and forming about 23 solar masses of new stars per year. Small galaxies like SL2S0217 can sometimes be hard to observe at large distances since they tend to be faint. However, this galaxy is serendipitously located behind a much larger galaxy, which gravitationally lenses it and magnifies its light by a factor of 17, simultaneously smearing it into an arc-like shape (see the cover image above). Using a model of the lens, astronomers have been able to reconstruct the true appearance of the galaxy, revealing a clumpy and irregular shape. In today’s paper, the authors used spectra of this galaxy obtained from the Keck I telescope to study its strong UV emission lines (Figure 2), which likely come from a combination of nebular gas around hot stars and from the interstellar medium (ISM). These features are highly unusual for redshift z = 2 galaxies, which generally don’t show signatures of strong emission. In order to figure out what the conditions in the real galaxy are like, the authors use the program CLOUDY17 to model the chemistry and photoionization occurring in nebular gas and the ISM, generating a simulated spectrum. By varying the input parameters to the model and comparing the simulated and observed spectra, the authors find the best-fit model to the observed spectrum — confirming the previous finding that the nebular gas of SL2S0217 is metal-poor and embedded in a hard radiation field. This hard radiation indicates that there is an abundance of high energy photons in the galaxy. Building on this result, their best fit is obtained when including the effects of binary-star evolution, indicating that this galaxy contains a high fraction of binary stars (which is not generally assumed when modeling stellar populations). However, one characteristic of the spectrum could not be reproduced using stellar photoionization alone: a particularly strong and narrow He II emission line (Figure 3). To reproduce this line, the authors consider additional ionization sources for the gas, separately incorporating the effects of shock and active galactic nuclei (AGN) heating into the photoionization code to see if these could potentially cause the high He II emission. Varying the shock velocity and the radiation field of the AGN, they find the inclusion of strong ionization from shocks or AGN into the model increases the predicted He II emission, but it does so at the expense of overpredicting the emission in the other observed lines. Thus, this line remains unexplained. 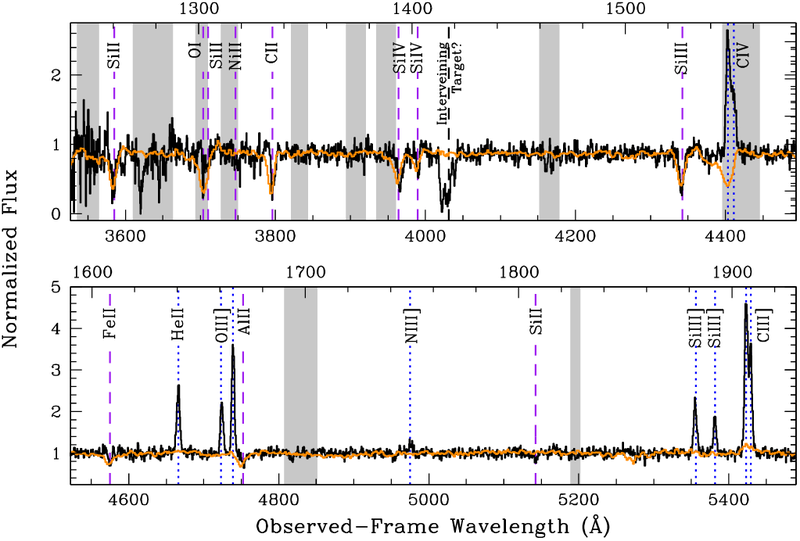 Another item of interest in the spectrum of SL2SJ0217 is its double-peaked Lyman-alpha emission (Figure 4). Lyman-alpha emission arises when an electron in the n = 2 orbital of a neutral hydrogen atom drops into the n = 1 orbital, emitting a photon with a wavelength of 1216 Angstroms. 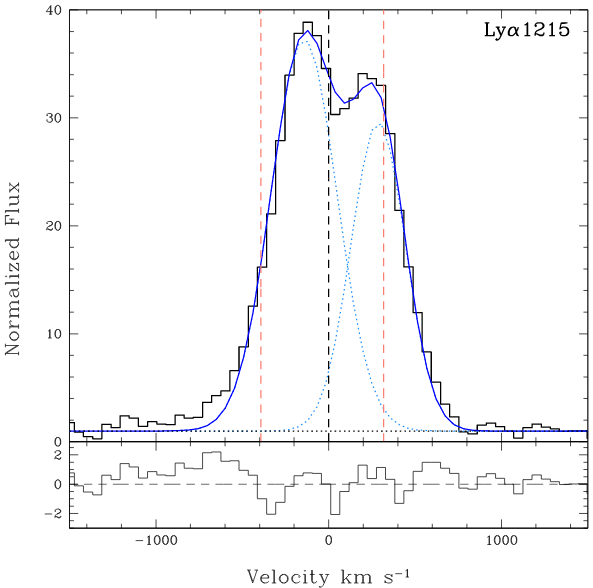 It isn’t uncommon to see Lyman-alpha emission in a galaxy, but the double-peaked structure is less typical. Luckily, simple models have shown that a double-peaked structure can arise in Lyman-alpha emission when the photons scatter through a spherical or shell-like cloud of gas around a region of star formation. The unequal peak heights can then be attributed an inflow of gas into the cloud. Thus, SL2SJ0217 appears to be hosting an inflow, which could also explain its star formation activity. Overall, it is clear that this galaxy has many unique characteristics distinguishing it from others at its cosmic epoch. However, the strong He II emission is unexplained and the authors speculate that better models of massive, metal-poor stars are necessary in order to fully explain the observed nebular emission. If SL2SJ0217 is indeed representative of the very first generation of galaxies, there is still some work do be done before we can understand them completely. I’m a third year graduate student at New Mexico State University working with Dr. Kristian Finlator. I use numerical simulations to study galaxy evolution during the epoch of reionization, with a focus on metal absorption in the circumgalactic medium.